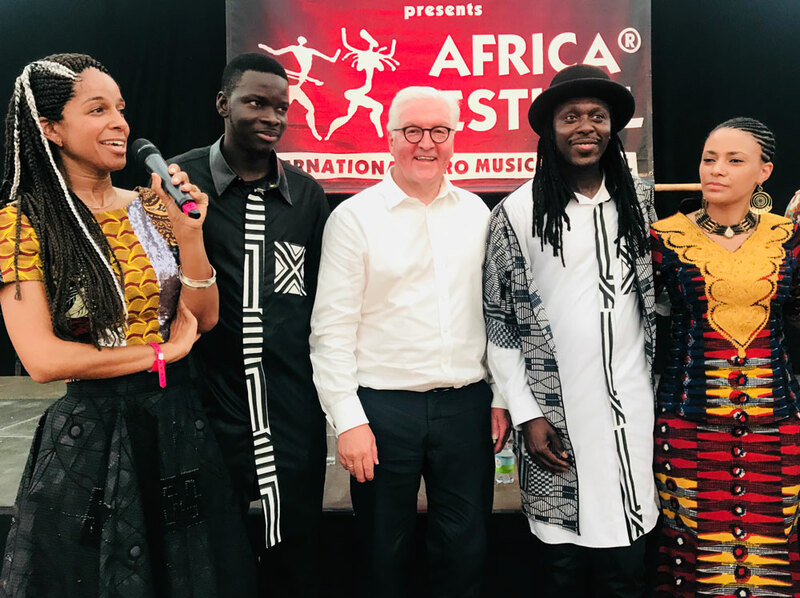 thank you very much for staying loyal to us and inaugurating the Africa Festival for the second time – this time as head of state and with your wife (Ms. Büdenbender). We would like to thank you for your words of appreciation and approval regarding the 30th anniversary of the festival. One tradition during the inauguration of the festival is the Africa Festival Awards. This year, we give the Africa Festival Award to a talented musician and singer who will also perform at this year's festival. It is a particular joy that you Mr. Federal President already know the laureate. The laureate herself doesn't know about the award yet, because, as always, it is top secret. The laureate receives the Africa Festival Award 2018 because of her great musical talent and amazing voice but furthermore also because of her commitment to the children of her home country. She recognized that music and education are the weapons against inexperience, intolerance and poverty. Therefor she used her own money to found a school. Besides the traditional music of their country the children also learn reading, writing, mathematics and are informed about important topics like nutrition and health. We are delighted to give the Africa Festival Award 2018 to Sona Jobarteh from the Gambia and her employees at the school, which she founded. Congratulations dear Sona! I would like to thank you on behalf of the staff for acknowledging our work within the last 30 years. We are delighted about the “Dancing Shepherd“ award, which also has a partner – the dancing shepherdess. The figurine of the award was created 250 years ago and is part of the court garden of the castle in Veitshöchheim – one of the most beautiful rococo gardens in Europe. To mark the occasion of this awards ceremony, we also brought a little surprise for you, Lord Mayor, which will hopefully get a special place in your office. 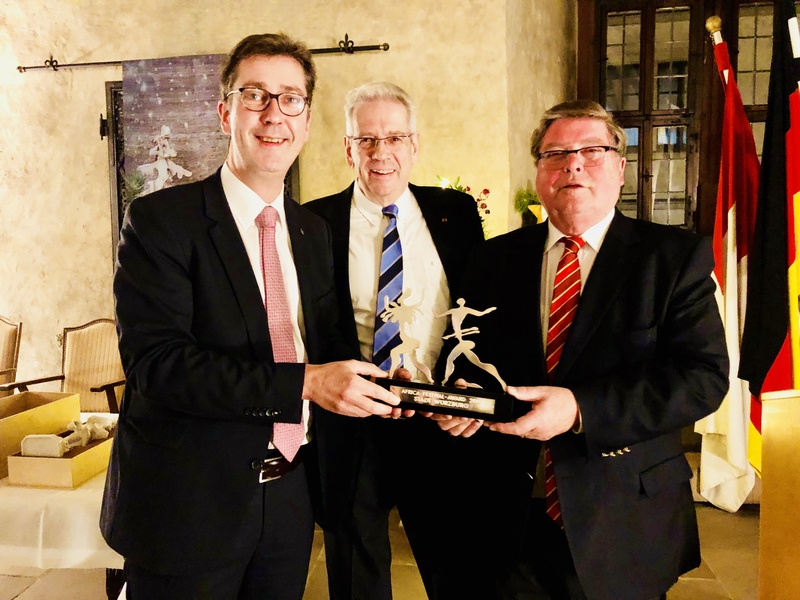 The team of the Africa Festival decided to give the Africa Festival Award 2018 to you, as you are a representative of the city of Würzburg, which has always supported the festival during the last 30 years. As you can see, we chose two dancing people for our Africa Festival logo. They are part of the national monument of Namibia and in 2007 were declared World Heritage by the Unesco. They are more than 4,000 years old. The San bushmen painted these figures onto the rocks in the North West of Namibia. The two figures represent the African zest for life. We were only able to bring the African music and zest for life to Würzburg thanks to the support of many people. The city of Würzburg has been an important partner for the last 30 years. Above all, I would like to mention the former head of the cultural office Gabriel Engert and cultural advisor Mr. Voll. These two have been supporting the festival from the start and made sure that, by the second festival, there was already a technical manager, which was provided by the city of Würzburg. For 10 years Mr Jochen Thüringer has been mastering this task with great commitment. We are also happy that in the last 30 years each year the festival was inaugurated by a representative of the city of Würzburg. This year was the exception, as the festival was inaugurated by Federal President Mr Steinmeier. The city of Würzburg has been supporting us during tough times, too. Thus, e.g. former mayor Jürgen Weber helped us a lot when a concert organiser wanted to have an event at Mainwiesen during the time of the Africa Festival. During the flood catastrophe in 2013 former mayor Mr. Rosenthal came to our rescue by e.g. providing the professional fire brigade. The city council has been financially supporting the festival from the start – without this support the festival wouldn’t have been possible as we have high expenses for e.g. the infrastructure. We would also like to thank the institutions of the city of Würzburg, which have helped us, for example the civil engineering department, which provided us with the signs and barriers, the parks office, which gave us plants for the decoration, the city draining for cleaning the sewers, the youth welfare office for providing us with the construction trailer and games, and the CTW for the pre-sale of the tickets and for advising the visitors when it comes to finding a hotel etc. We would like to thank Ms. Dittmann from the protocol for organising the visits of the president of Zanzibar, the Federal President as well as other special guests. Special thanks go to Ms. Birgit Steinmetz who always provided advice in difficult situations.